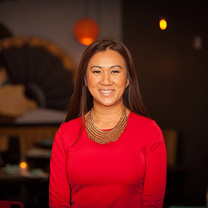 Chef Uno is the founder of Chino Chinatown in Trinity Groves and chef/owner of Red Stix at Legacy Hall. She was on “ABC’s The Taste” competing on Anthony Bourdain’s team. A Chef Uno Immanivong specialty, brought to you by PAM Cooking Spray. "Redefining anchovies. Brined in delicate herbs and the balanced with a light cream, citrus oil and radish curls." "Seared duck breast, confit duck leg with fried rice. The rice is studded with crispy bits of roasted peanuts and drizzled with a chili lime sauce." "A swirl of squid ink pasta, sautéed Chantelle mushrooms and a beautiful flutter of bonito flakes." "You scoop your spoon in this heaven bite. The perfect bite has a little sturgeon caviar, crisp potato chip flakes and a delicate foam with just a hint of citrus." "It tasted like the fruity pebble milk was saturated until the thick slices of bread and the sour cream drizzle add the right amount of tartness." "New recipes in progress. Melinda's Jammin' Bacon Cheese Burger & Chicken Fried Steak Sandwich with Bacon Gravy. Both feature the perfect brioche bun from Village Baking Company. Videos coming soon. #chefuno @heatandflavor"
"Smoked ribeye with a Thai salsa for a Texas Beef Council video. The magical part of this recipe is that the smoke for the steak can be achieved indoor using your stove and a couple tools you already have. @#indoorsmoking"
"Beef Noodles at Monkey King Noodle, perfect teeth feel on the noodles and robust beef broth and healthy morsels of tender brisket." "Dim Sum NYE party and Drag Queens...that's how we roll at Chino Chinatown!" "I'm pretty sure brunch is the antidote for Saturday nights hangover. #chefuno"
"Inspiration of the day: Quattro leches cake with coconut milk, rum, milk chocolate ganache, torched meringue and pistachio brittle. #chinochinatown"